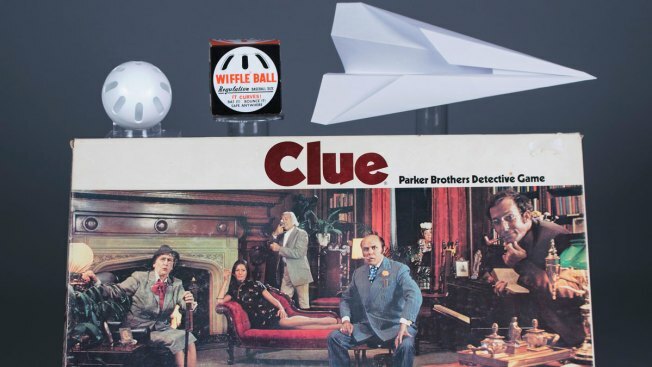 This undated photo provided by The Strong shows the three toys inducted into the National Toy Hall of Fame Class of 2017, from top left, the Wiffle Ball, the paper airplane and the board game Clue. The trio was honored at the upstate New York hall on Thursday, Nov. 9, 2017. The mystery of which toys earned the status of toy superstardom was solved Thursday with the announcement of the hall of fame's Class of 2017. "Clue has also had its own movie, been featured in numerous television shows and books and remains an icon of pop culture," said curator Nicolas Ricketts, who added the game has spun off travel, junior and advanced versions, as well as collectors and themed editions. This year's other finalists were: the game Risk, Magic 8 Ball, Matchbox cars, My Little Pony, PEZ candy dispenser, play food, sand, Transformers and the card game Uno. David Mullany began by cutting holes in round plastic parts from a factory, eventually developing a ball with eight oblong slots that allow the ball to grab air and change and slow its trajectory. A strike-out was called a "wiff," according to the family-owned Wiffle Ball Inc., which has produced millions of balls each year ever since. "Where some toys require financial investment, paper airplanes start with a simple sheet of paper, coupled with creativity and dexterity, to produce a toy with infinite aeronautical possibilities," said Christopher Bensch, The Strong's vice president for collections. "They allow the imagination to take off and soar."